'"Gifted" was the eighth episode of the second season of Daria (episode number 208). It first aired on MTV on June 29, 1998. "Gifted" was written by Peggy Nicoll. Jodie and Daria are invited to visit Grove Hills, an elite school for academically gifted students. Daria isn't impressed, but goes along with it when Helen bribes her. Quinn is informed that she'll be staying behind for the weekend; visions of staying home alone (and partying) are shattered when Helen works out a deal with Sandi's mother, Linda, to allow Quinn to stay with them while they're gone. While Daria and her parents give Jodie a ride to Grove Hills (her parents will meet them there and drive her home), Quinn slowly and methodically wears out her welcome with all three Fashion Club members: Sandi, when her younger brothers fawn all over Quinn; Tiffany, when Quinn blows up at her for constantly asking if she's "too fat"; and Stacy, where Quinn actually runs off after getting creeped out by Stacy's way-too-needy overtures of friendship. (The final straw is when Stacy dresses up like her...) She ends up at the Lane house and pleads with Jane to let her stay the night. Jane lets her stay when she realizes that Quinn is terrified to be home alone, but almost immediately regrets it when her shallow and self-centered attitude starts driving her crazy. Daria and Jodie quickly hit it off with Grove Hills students Graham, Lara, and Cassidy, who turn out to be just as smart and sarcastic (and annoyed by perky Grove Hills recruiter Marina) as Daria is. Unfortunately, it turns out they're even more stuck-up and obnoxious than the students at Lawndale High -- poor David is a social leper for getting an SAT score "only" in the 90th percentile -- and Graham in particular is obsessed with being 'better' than all the plebs at public school. Jodie valiantly tries to make nice, but she eventually reaches her limit when she's told they don't want to listen to her opinions until she's a Grove Hills student. She snaps, tells off the other students, and storms out, with Daria right on her heels (after getting off a parting shot of her own). She finds Jodie sitting outside on a bench and stewing over the whole experience, and both girls have a heart-to-heart talk, with each admitting that they sometimes wish they could be more like each other... and both agreeing that they're better off at Lawndale High. Helen and Jake are pretty glad to hear that because they'd found out that nine percent of Grove Hills students have a severe mental breakdown, though Helen pretends she thinks Daria's making the wrong decision to save face ("but you said--" starts a confused Jake); the Landons have also decided that Jodie doesn't have to go, with Michelle making acidic comments in Andrew's direction about how she wouldn't make someone do something they'd regret. When the Morgendorffers finally get home, an emotionally frazzled Jane escorts Quinn home, making Daria extremely curious about what happened over the weekend. 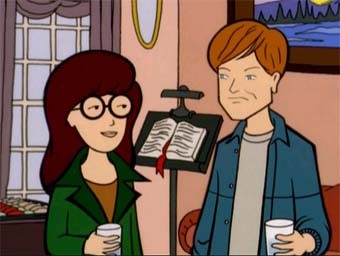 In the opening scene, Daria is shown reading an anthology of Edgar Allan Poe's short stories entitled The Telltale Heart and Other Stories, which Brittany mistakes for a romance novel. In the final scene, Daria and Jodie compare reading material: Daria is reading Joseph Conrad's Heart of Darkness while Jodie is reading Dale Carnegie's How to Win Friends and Influence People. Graham realises he just got burned. Quinn once held a wild keg party when the rest of the family were out, where Jamie puked in Helen's closet. Andrew Landon is full of extreme paternal pride in his son Evan, to the creepy extent of calling him a linebacker -- when showing a photo of a tiny baby plonked next to a ball. This was the only episode in which Jodie openly insulted Brittany with her "Rent a brain" remark, usually Jodie is much more subtle with her Jabs at Brittany. This is probably Jodie's trying to act more like Daria after the two admitted that they respected one another. 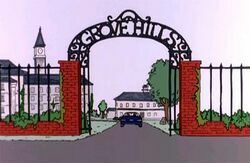 Very little has been made of Grove Hills and its "elite" cadre of students, and few fanfics have explored the alternate-universe possibilities of Daria attending school there. Brother Grimace has used the school twice: in The Trouble with Veronica, a story by that has the fanon third Morgendorffer sister, Evelyn Veronica Morgendorffer ("Evie") electing to attend Grove Hills to avoid conflicts with her sisters. In the Legion of Lawndale Heroes saga, Grove Hills student Graham is revealed to be a member of The Elite, which leads to horrifying consequences for him. NightGoblyn has also used Grove Hills; in the Evil Daria Vignettes, after time is reset, Quinn and Evie are shown arriving for their first day at the school and being greeted by their 'cousin' Daria and her best friend, Elsie Sloane. They find out that Daria is a very popular girl at Grove Hills, and is dating Jane, whom she met on Dega Street. Amusingly, in Richard Lobinske's John Lane tales, Daria never goes to visit Grove Hills with Jodie ("Fairly Illuminated"). Scissors MacGillicutty made a sound collage of Stacy's line to Quinn, "Don't tell anybody this, but I like you best out of everyone in the Fashion Club," over the beginning of the Concerto for Orchestra by Béla Bartók entitled Stacy/Bartok/Fear. Stacy's voice is digitally slowed down and deepened, and thick reverberation added; his intent was to accentuate the lugubrious, Single White Female-esque implications of the line. However, more than one fan could not recognize the voice as Stacy's, so he considers it a failure. "Eldritch Evolution", by LSauchelli: A super-powered Daria attends Grove Hills. "The Trouble with Veronica", by Brother Grimace: Daria and Quinn's younger sister attends Grove Hills. "Fairly Illuminated", by Richard Lobinske: Jodie visits (and hates) Grove Hills, but not Daria. This page was last edited on 20 July 2013, at 10:49.